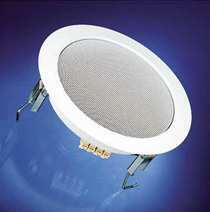 5 cm (4"") ceiling mounted loudspeaker with white mounting frame. Easy fitting without screws and drilling holes. Installation like halogen light fittings. Equipped with FRWS 5 full range driver. Waterproof / usable up to 110 °C. 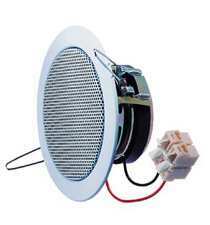 8 cm (3.3"") ceiling mounted loudspeaker with white metal cover (RAL 9010). 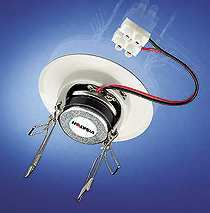 Suitable for suspended ceilings of all materials. Easy fitting with circular cut-out and clips. Waterproof / usable up to 110 °C. like DL 8 8 Ohm, however, in 100 V design for 0.75 / 1.5/ 3 Watt. The receiver is attached to the rear of the magnet, increasing the mounting depth to 71 mm. 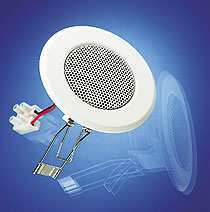 10 cm (4"") ceiling mounted loudspeaker with white metal cover (RAL 9010). Suitable for suspended ceilings of all materials. Easy installation with circular cut-out and clips. The speaker is connected with spring clips, Waterproof / usable up to 110 °C. like DL 10 8 Ohm, however, in 100 V design for 1.5 / 3/ 6 Watt. The receiver is attached to the rear of the magnet, increasing the mounting depth to 76 mm. 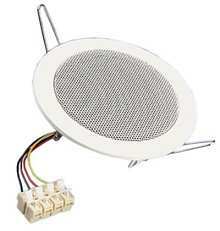 17 cm (6.5"") hi-fi ceiling mounted loudspeaker, equipped with 2 way coax driver. With white, stainless metal cover. 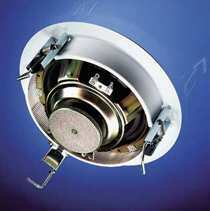 Suitable for suspended ceilings of all materials. Quick installation with circular cut-out, speaker is fitted using snap-in technology. Upon request the speaker is available in RAL colours. 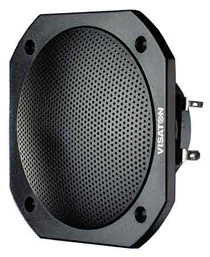 Sea water resistant 10 cm full range speaker with even frequency response for outside use, boating, sauna etc. The driver features a glass fibre diaphragm, synthetic basket and cover. Waterproof / usable up to 110 °C.